A new open access article titled “Marine Protected Areas and Fisheries: Bridging the Divide” has just been published online here. In this article, my co-authors and I explore lessons for effectively bridging the divide between biodiversity conservation and fisheries sustainability goals using marine protected areas through drawing on 8 case studies from around the world. Abstract: Long-term and well-managed marine protected areas (MPAs) can, under the right circumstances, contribute to biodiversity conservation and fisheries management, thus contributing to food security and sustainable livelihoods. 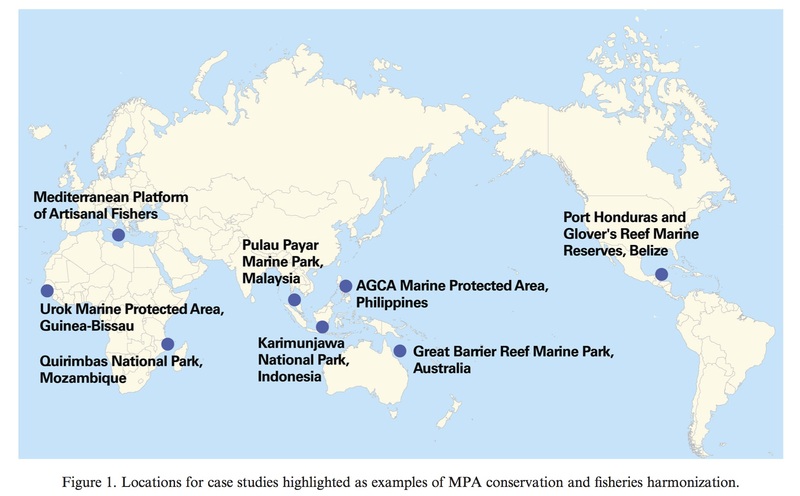 This article emphasizes (1) the potential utility of MPAs as a fisheries management tool, (2) the costs and benefits of MPAs for fishing communities, and (3) the foundations of good governance and management processes for creating effective MPAs with a dual fisheries and conservation mandate. This article highlights case studies from numerous regions of the world that demonstrate practical and often successful solutions in bridging the divide between MPA management and fisheries sustainability, with a focus on small-scale coastal fisheries in order to emphasize lessons learned. To be an effective fisheries management tool, MPAs should be embedded in broader fisheries management and conservation plans. MPAs are unlikely to generate benefits if implemented in isolation. The spatial and temporal distribution of benefits and costs needs to be taken into account since proximal fishery-dependent communities may experience higher fishing costs over the short and long-term while the fisheries benefits from MPAs may only accrue over the long-term. Key lessons for effectively bridging the divide between biodiversity conservation and fisheries sustainability goals in the context of MPAs include: creating spaces and processes for engagement, incorporating fisheries in MPA design and MPAs into fisheries management, engaging fishers in management, recognizing rights and tenure, coordinating between agencies and clarifying roles, combining no-take-areas with other fisheries management actions, addressing the balance of costs and benefits to fishers, making a long-term commitment, creating a collaborative network of stakeholders, taking multiple pressures into account, managing adaptively, recognizing and addressing trade-offs, and matching good governance with effective management and enforcement. The article can also be downloaded from here. Weigel, J.Y., Mannle, K.O., Bennett, N.J., Carter, E., Westlund, L., Burgener, V., Hoffman, Z., Da Silva, A.S., Kane, E.A., Sanders, J., Piante, C., Wagiman, S. & Hellman, A. (2014). Marine protected areas and fisheries: Bridging the divide. Aquatic Conservation: Marine and Freshwater Ecosystems 24(S2), 199-215.